The terms thyristor include all four layer P-N-P-N devices used for control of power in AC and DC systems. The silicon controlled rectifier is the most popular member of the thyristor family. There are several other members of the thyristor family like GTO, ETO, PUT, SUS, SCS, TRIAC, DIAC etc. In recent years, most development effort has gone into both continued integration of the gating and the control electronics into thyristor modules and the use of MOS technology to create gate structures integrated into the thyristor itself. Many variations of this theme are being developed and some technologies should rise above in the others in the years to come. 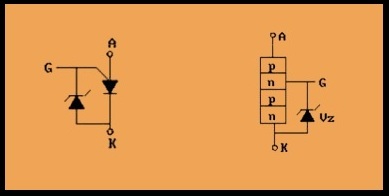 PUT full form is Programmable Uni Junction Transistor is a P-N-P-N device like SCR full meaning, but the major difference is that the gate is connected to n-types material near the anode as shown in the figure. PUT is used mainly in time delay, logic and also have SCR trigger circuits. Circuit symbol and I-V characteristics of a PUT are shown in the figure. In a PUT, Gate is always biased positive with respect to the cathode. When the anode voltage exceeds the gate voltage by about 0.7 V around, Junction j1 point gets forward biased and PUT turn on. 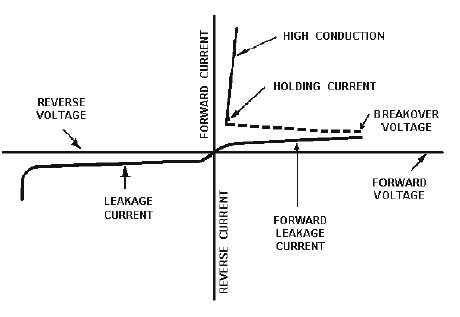 When anode voltage becomes less than apply gate voltage, PUT is become turn off. 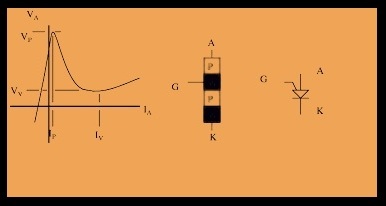 SUS full form Silicon Unilateral Switch is similar to a PUT but with an inbuilt low voltage avalanche diode between gate and cathode as shown in the figure. Because of the presence of diode, SUS turns on for a fixed anode to cathode voltage unlike an SCR whose trigger voltage and/or current vary widely with changes in ambient temperature. SUS is used mainly in timing, logic, and trigger circuits. Its rating is about 20 V and 0.5 A. circuit symbol, equivalent circuit and I-V characteristic of a SUS are shown in the figure. SCS full form silicon control switch. 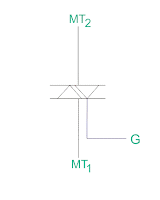 For example Four electrons thyristor. It has two gates, one anode gate (AG) like a PUT device and another cathode gate (KG) like an SCR. 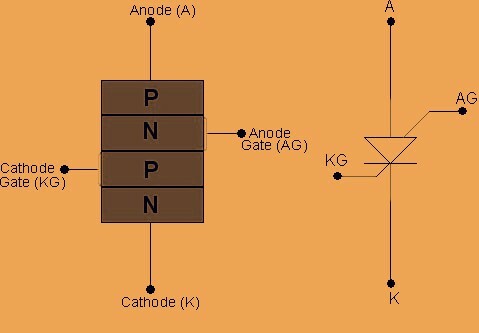 In other words, SCS is a four-layer, four terminal P-N-P-N devices; with anode A, cathode K, anode gate called AG, and cathode gate called KG to shown in the figure. SCS can be turned on by either gate. 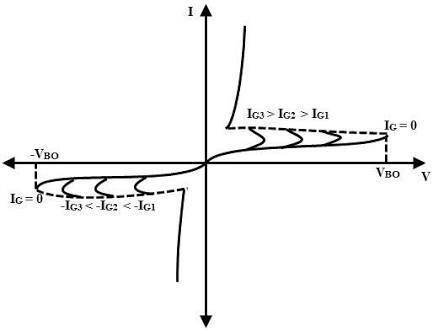 Circuit symbol and also I-V characteristics of an SCS are shown in the figure. 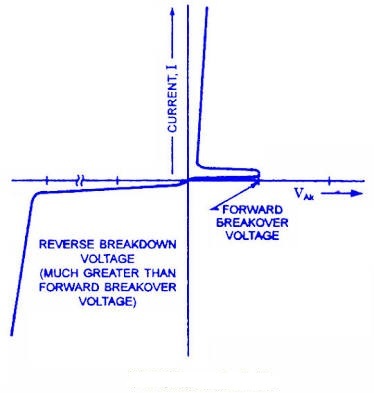 When a negative pulse is applied to gate anode (AG), junction J1 is forward biased and at that time SCS is turned on. A positive pulse at AG will reverse bias junction j1 and turn off the SCS. A positive pulse at gate kathode (KG) turns on the device and a negative pulse at KG turns it off. The application includes the timing, logic and triggering circuit, pulse generators, voltage sensors, oscillators. The circuit symbol and I-V characteristics light activated thyristors, are also called LASCR, are shown in the figure. LASCR is turned on by throwing a pulse of light on the silicon wafer of the thyristor. The pulse of the appropriate wavelength is guided by optical fibers to the special sensitive area of the wafer. 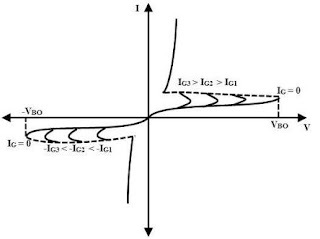 If the intensity of light exceeds a certain value, the excess electron-hole pair is generated due to radiation and forward biased thyristor gets turned on. The primary use of light fired thyristor is in high voltage, high current application and also static reactive power compensation etc. A light fired thyristor has complete electrical isolation between the light triggering source and the high voltage anode-cathode circuit. Light-activated thyristors are available up to 6 kV and also 3.5 kA, with on state voltage drop of about around 2 V and with light triggering requirement of 5mW. Across-sectional view of a DIAC showing all its layers and junction is depicted shown in the figure. 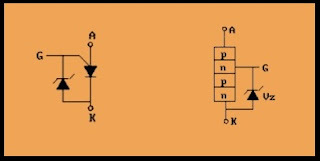 If voltage V12, with terminal 1 positive with respect to terminal 2, exceeds break over voltage VB01, then structure P-N-P-N conducts. The term Diac is obtained from capital letters called, DIode that can work on AC. To show in figure Diac has symmetrical breakdown characteristics. Its leads are interchangeable. 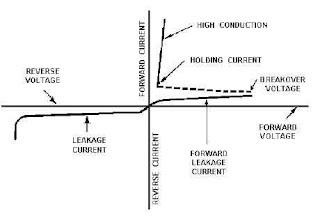 Its turn on voltage is about 30 V. When conducting, It acts like a low resistance with about 3 V drop across it to shown in figure. When not conducting, it acts as an open switch. 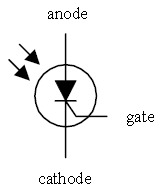 A DIAC is sometimes called a gate less TRIAC. SCR full form Silicon Control Rectifier is a unidirectional device that can conduct from anode to cathode only and not from cathode to anode while A Triac can conduct in both the directions. 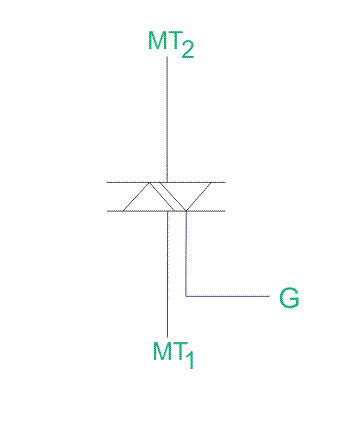 A TRIAC is thus bidirectional thyristor with three terminals MT1, MT2, and Gate. It is used extensively for the control of power in the AC circuit. The word Triac derived by combining the capital letters from the word TRIode and AC. 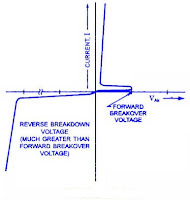 When in operation, a Triac is equivalent to two SCRs connected in anti-parallel. 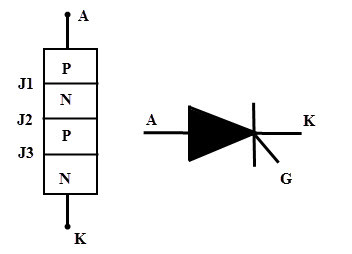 The circuit symbol and its characteristics are shown in the figure.